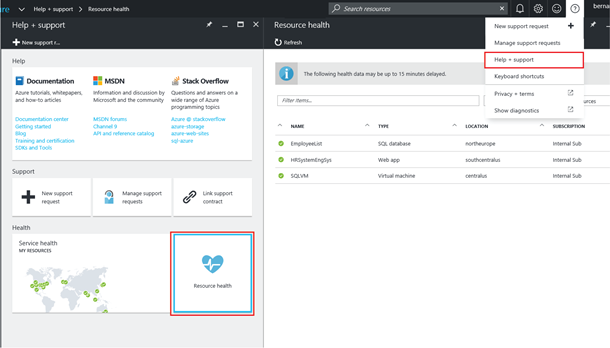 Today we are pleased to announce the public preview of the Azure Resource health history blade, a new feature that exposes up to 14 days of historical health information. 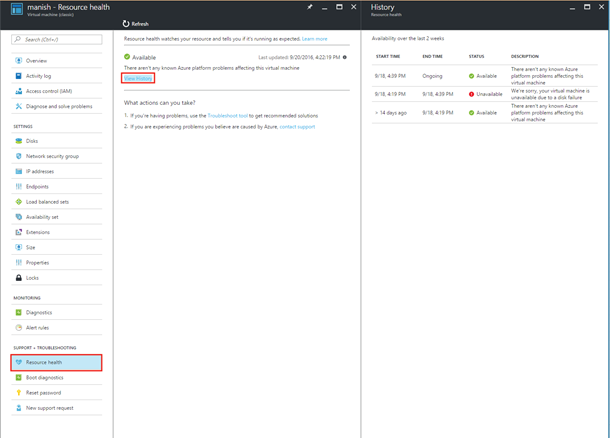 Up until now, Resource health has helped customers reduce the time spent on troubleshooting ongoing problems, in particular reducing the time spent determining if the problem is caused by an event inside the Azure platform or by a problem in the application. This new feature makes it easier to investigate problems occurred during the last 14 days. The easiest way to open the Resource health blade is to navigate to the resource blade and click on Resource Health. This blade will show the current health of the resource, as well as recommended troubleshooting steps that are customized based on the current health status. 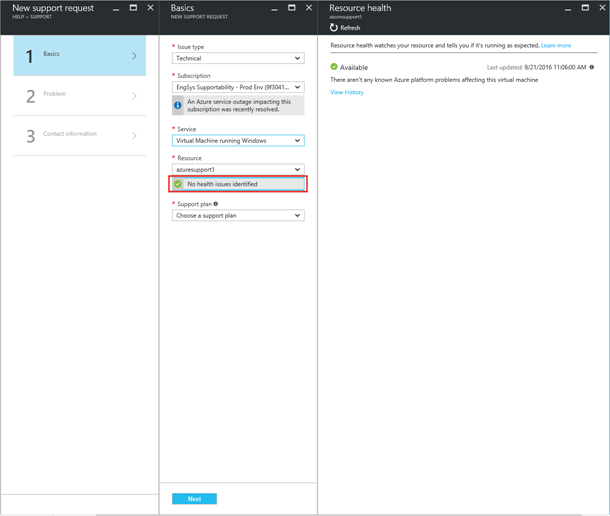 It is important to highlight that since entering Public Preview, we have made a number of improvements to help with troubleshooting, including tighter integration with the troubleshooting experience in the portal. To access the historical health data, click on the View History link located under the current health state. The history blade shows any changes in the health of the resource during the last 14 days, including the staring time, the end time and a summary of the text customers would have seen if they had visited the Resource health blade during this time. 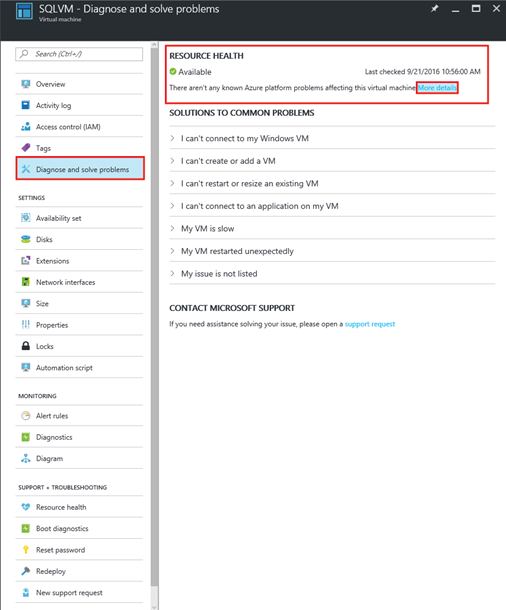 In the screenshot above you can see that the virtual machine was available until September 19th at 4:19PM when due to a disk failure, it became unavailable until 4:39PM when it was recovered. As mentioned above, the easiest way is to click on Resource health in the resource blade. Keep in mind that Resource health will only be displayed for resource types available in Resource health. Another way is by browsing to the Resource Health List Blade which displays the health of all resources in all your subscriptions. Open this blade by clicking on the Resource health tile located in the Help + Support blade. Once in the Resource Health List blade you can filter by subscription or by resource type. Resource heath is a key data point when troubleshooting problems, so during the past few weeks we incorporated the Resource health signal in the Troubleshooting and the Case submission blades. You can access the Troubleshooting blade by clicking on Diagnose and solve problems in the resource blade. Once the troubleshooting blade opens, Resource health will be displayed at the top. Clicking on More Details will take you to the Resource health blade. In the case submission workflow, you will see the health once you have selected a resource. Exposing the historical health of a resource is a big step forward on our journey to provide you with the data and the tools you need to troubleshoot problems. During the upcoming months, stay tune for additional improvements to Resource health and for more services to become available through it.